Our previous two articles discussed reading deer sign for "tracks," and reading deer sign for "scrapes and rubs." This article will talk about reading deer sign for "droppings." Deer droppings are not usually thought of by hunters as providing much useful information--but they do. 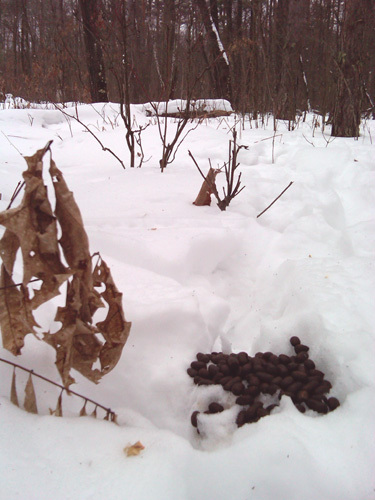 Typically, deer droppings will consist of small jelly bean-shaped droplets scattered about in little piles on trails. They vary in color from brown to black, depending on the forage that has been digested. Usually these droppings are the product of small- to average-sized deer. Savvy deer hunters recognize that big deer can be readily identified by droppings. A big deer's droppings are distinct from smaller animals. Usually, a big deer will leave droppings that are somewhat tightly packed and clomped together in a big ball. And they are not scattered all over. If a hunter sees this type of big clomped ball of dropping, he/she will know they're on the track of a big buck. Also, when hunters scout -- particularly in the spring -- deer droppings will readily tell where the deer have been herding over the winter. The trails that lead to these herding areas will be literally covered with deer droppings, and of course if there are some scattered big clomps, that will be a sign that there are some big bucks in the group. As with every aspect of hunting, it's important to "combine" all of the "sign reading" for deer into one comprehensive "picture." Total reliance on any one aspect of deer sign --be it tracks, scrapes and rubs, or droppings -- will not give you the full, needed scenario. That means patience, and a lot of work. And for sure, don't wait until the day before the season to start your efforts. Most successful hunters read sign throughout the year. Things change, and deer will move about depending on many variables – food and water sources, cover and herd areas, weather and terrain, clearcutting of forest land, fire, presence of predators, and any number of others. It's important that you recognize changes in patterns, and that can happen quickly. Also, don't necessarily rely on what you or others have found in "past seasons." While some things do remain static, reliance on past years is not a totally reliable bellwether for predicting deer patterns. They change every year in some aspect. Therefore, it's critical that you "mentally" wipe the slate clean each and every year and prepare for change. The hunter who starts reading sign anew every year is the hunter who usually ends up with the biggest trophy buck in the woods.